Place the dry spinach leaves on to a pre heated grill for around 20–30 seconds until wilted Remove, squeeze off any excess moisture with a kitchen towel. Place the chicken breasts on the grill for 6-8 minutes then remove and cut into strips. 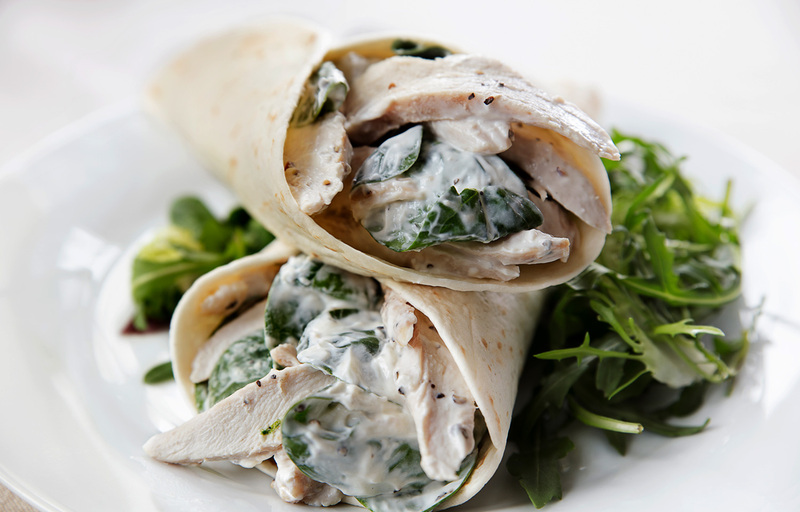 In a bowl, combine the chicken strips with the cream cheese, mustard powder, nutmeg, pepper and spinach. Spoon onto the centre of the tortilla wraps, fold over the end to secure and roll up. Place on a hot grill and heat for 2 minutes until warmed.